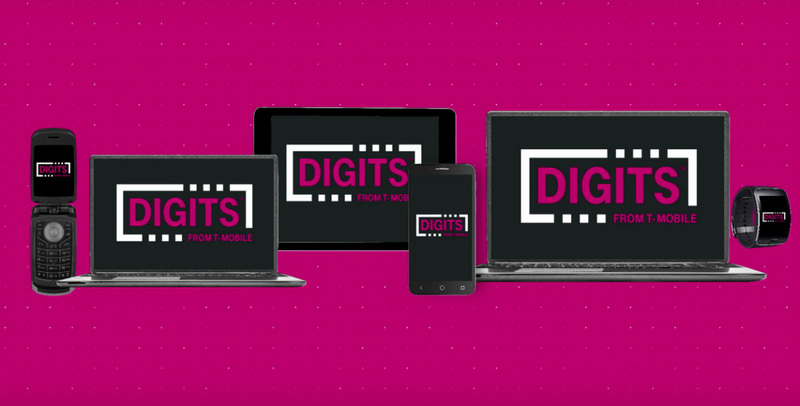 This morning, T-Mobile took the wraps off its latest technology introduction, DIGITS. The idea here is very much Google Voice meets AT&T’s NumberSync in that you get to use a single phone number (your “DIGITS”) across multiple devices and have additional phone numbers funnel through it. T-Mobile’s take on this type of technology allows you to access your “DIGITS” number (calls, contacts, texts, and voicemails) on phones, tablets, wearables and computers. You can even have it setup to funnel through an old flip phone. T-Mobile says that they are taking this 1-number to rule them all idea further by letting customers attach multiple T-Mobile numbers on the same device. That means accessing numbers from work, home, and a personal line on a single smartphone. Still not following? T-Mobile created DIGITS, along with apps and web interfaces that let you access your DIGITS and manage not only phone calls, texts, and voicemails, but the numbers associated too. Say you have work, home, and a smartphone phone numbers in your life. With DIGITS, you would funnel all of those behind a single number (your DIGITS). Then, you could receive calls to your DIGITS, even if they were placed to those other phone numbers. DIGITS also allows you to decide which phone number to call from each time you make a call, so if you want to keep work and personal numbers separate, you can. Taking all of that further, T-Mobile has made this service work on other carrier phones (AT&T, Verizon, Sprint, etc.). They haven’t said specifically, but my guess is that it works on those carriers because you can install an app on those carrier phones and then access it all. Which devices does this work on? For the most part, every device. T-Mobile worked with Samsung to build DIGITS technology natively into the Galaxy S7 and S7 Edge dialers, but other devices just need to download an app to get a similar experience. T-Mobile says they are working with other manufacturers to try and build in the tech. As of today, DIGITS is only launching in a limited beta program. Sorry, you can’t all have it today, T-Mobile customers. T-Mobile expects the service to launch at some point early next year. You can sign-up the beta right here.